What internal storage options are available in most types of lab refrigerators? Lab refrigerators have many of the same features as a traditional home style of fridge. They are specifically designed to have a variety of different internal configurations that will suit the specific type of storage capacity and container shapes and sizes used within the lab or medical facility. This flexibility makes them a great option and also provides easy storage of very small and relatively large containers. Bins on the bottom of the fridge allow for storage of a variety of different types of materials and containers. Shelves within the unit are fully adjustable to allow the users to reconfigure the interior design as often as necessary. Most of the lab fridge adjustable shelves will be made of wire so they are very easy to clean and allow for easy visibility in the unit itself. Shelves on the door of the full sized fridges are adjustable as well. These shelves have lips or ledges that secure any objects in place when the door is opened or closed. Different adjustments allow for storage of small or larger bottle, vials and containers on the door. What are the sizes of lab refrigerators available and which is the most energy efficient? 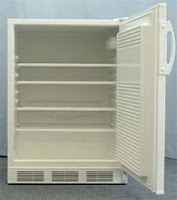 There are full sized and under the counter models of refrigerators available. The full sized fridge is typically 11.2 cubic feet in interior capacity and has an exterior measurement of approximately 23.5 inches in width by 24 inches in depth and a height of 59 inches. Interior dimensions are 20.7 by 18.8 by 52.4 inches, providing a significant amount of storage space. The smaller under the counter models are designed to fit under a standard counter or workbench and are 23.7 inches in width by 23.5 inches in depth and 33.5 inches in height. They also have an interior capacity of 6.1 cubic feet, making them an excellent option for individual work areas or smaller labs. Both are designed to be energy efficient and low cost appliances to run within a lab. 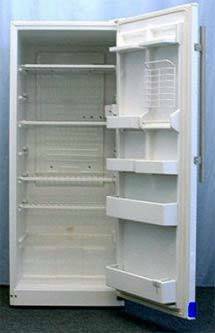 Of course energy efficiency is partially a function of the amount of material stored in the fridge as well as the number of times the door is opened and closed. Energy efficiency is always highest when the unit is not overloaded with material and the door is not constantly opened and closed. How easy is it to clean and decontaminate a standard model of lab refrigerator? Designed to have a seamless interior, easy to remove shelving units, bins and containers as well as a smooth and scuff resistant interior and exterior these lab fridges are very easy to clean and decontaminate. Standard cleaning and disinfecting products can be used in the unit and there is no requirement for any specialized equipment. Bins and shelves that are removed can be cleaned the same as traditional appliances and can easily be soaked in warm water and bleach to remove difficult stains and spills.